Goodbye Barrio Central, hello Barrio Soho. One of London’s favourite Latino late night hangouts is re-launching with new decor, a new chef, new cocktails and a new Mexican-centric food menu. Fear not Barrio lovers, live music and general party vibes haven’t gone anywhere. Recently appointed Group Head Chef Ernesto Pavia (Garufa and Garufin, Bubbledogs) sees the return to authentic Latin American food influenced by his Peruvian routes. The menu, designed with the relaxed atmosphere of Barrio Soho in mind, comprises an assortment of snacks, small plates, tacos and sharing platters. We love the sound of Ceviche Mixto, fresh mix of seafood in tiger’s milk, with avocado, crispy sweet potato & serrano chilli. 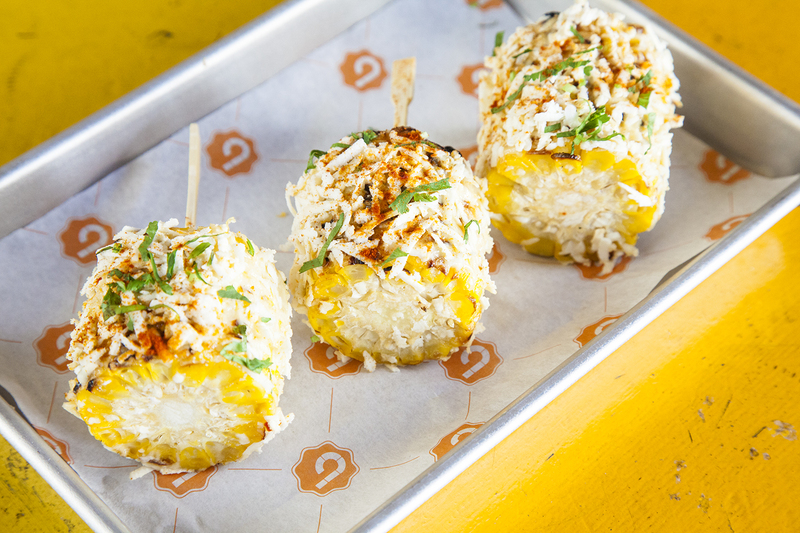 The heavenly Elotes are perfect for sharing, three perfectly formed grilled corn on the cobs slathered with cheese, lime and chilli mayo, aww hell yes! The fun continues into the cocktail menu. If, like me, you love a good rum cocktail then you are in the right place. The Gingerbread Colada puts a twist on Del Boy’s favourite beverage. Santa Teresa Gran Reserva rum with pineapple and coconut are taken for a spin by a ginger baked man. For a fresh fiery flavour grab a Wonkey Donkey made with Casco Viejo tequila, elderflower, ginger and lime and soda. I’ll have one of each please. Latin inspired new-look Barrio Soho remains playful, fun and vibrant. Recommended for when you can’t decide whether to eat out or party – why not BOTH? Great read and very well written. Nice easy layout too. Big fan! Thank you so much Lauren. Loving Living with Lauren too!